While rising Internet and smartphone access fueled growth in Asia Pacific (APAC) in 2016, varied infrastructure development, digital payments adoption and regulations make for an uneven e-commerce landscape across the region. 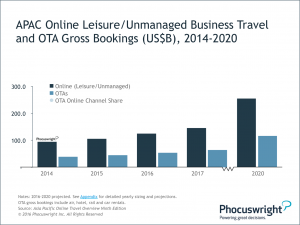 Phocuswright’s Asia Pacific Online Travel Overview Ninth Edition: Online Travel Agencies analyzes the competitive dynamics throughout APAC, with insight into online travel agency (OTA) gross bookings and growth rates. The report takes a deep dive into the four major OTA trends in APAC. APAC is the world’s third-largest OTA region: Gross bookings hit US$44.5 billion in 2015, up 15% over 2014 and are forecasted to reach $96.5 billion by 2020. Internet and smartphone penetration continue to rise, supporting travel bookings’ migration from offline to online channels in the region. 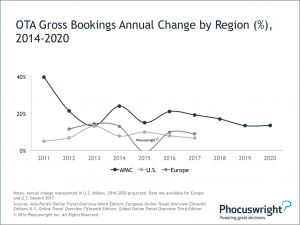 With relatively underpenetrated online travel markets such as China, India and Southeast Asia fueling OTA growth, APAC OTA gross bookings grew 21% in 2016. The supplier market structure also adds to OTA growth in the region. Broadly, the APAC air market is crowded and the hotel segment is highly fragmented, offering OTAs an advantage in aggregating and distributing varied content in one place. With ever-increasing smartphone penetration, APAC OTAs are allocating more resources toward mobile product development and marketing. Abetted by sales via apps, mobile share of OTA gross bookings in China hit 45% in 2015 – the highest in the world. As technology companies, OTAs have a strong lead over suppliers across markets when it comes to mobile development and products. While suppliers largely focus on and distribute a single product/segment, most OTAs distribute an array of products within a single mobile platform, thus appealing more to consumers. OTAs accounted for the majority of mobile gross bookings share in the region in 2016: India (86%), Japan (54%), China (52%). Combined OTA mobile gross bookings for China, India and Japan were $14.7 billion in 2015, up 52% year-over-year. Continued discounting and price wars on mobile, however, dragged down transaction values (and put pressure on revenues) particularly in China and India, restraining OTA mobile gross bookings from growing at a faster rate. 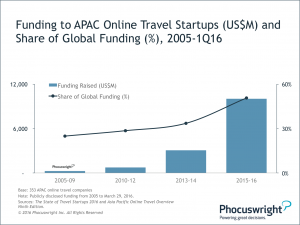 Aggregate publicly disclosed funding to APAC digital travel startups exceeded $14 billion from 2005 through 1Q16, accounting for 43% of global funding. New entrants are challenging the established order and deploying capital toward price wars to win customer loyalty. 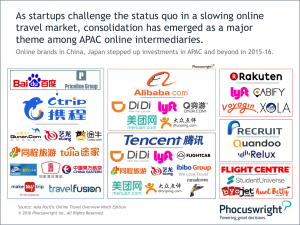 Funding to the region’s online travel companies has accelerated dramatically in the last decade; Chinese startups attracted 75% of the total regional funding. Incumbent OTAs face competition – and a threat of displacement – from emerging intermediaries, which are tapping into new categories, attracting investor dollars and gaining consumer traction. As the region’s online travel industry matures and growth softens, major e-commerce players and OTAs have made notable investments and acquisitions to strengthen their positions in several markets. As consolidation looms in the region, it’s eat or be eaten for APAC OTAs. Want more information on OTA trends in the region? Get it straight from the leaders of APAC’s biggest OTAs at Phocuswright India (February 28 – March 2, 2017, in Gurgaon, NCR, India). Phocuswright India provides an unmatched opportunity to meet, learn from and collaborate with Asia Pacific’s top decision makers. Explore the trends, technology and turmoil affecting the Asia Pacific travel market. See industry innovators during Battleground. Hear from the most influential travel leaders during Center Stage. Find practical advice you can put to work in your own business during workshops. Joint Interview: MakeMyTrip and ibibo Group. Two of India’s largest online travel companies have merged. Hear from Ashish Kashyap, co-founder and president, and Rajesh Magow, co-founder and CEO, on where they go from here and what it means for the rest of the market. Keynote: Yatra.com. Hear from Yatra’s co-founder and CEO, Dhruv Shringi, on distribution, competition, discounting and running an OTA in the public eye. Joint Interview: Alitrip and Paytm. Step by step, Alibaba has emerged as a prominent force – and investor – in the Chinese digital travel distribution space. Hear about Alibaba’s travel ambitions through a combined interview with the heads of its travel businesses in China and India, Tony Duan and Abhishek Rajan. Albert Pozo, President, Amadeus Asia Pacific, Amadeus IT Group S.A.
Register now to network and learn from Asia Pacific’s most innovative thinkers and leaders in the hospitality, travel and tourism industry. Creative Crest is pleased to be a partner for the summit.